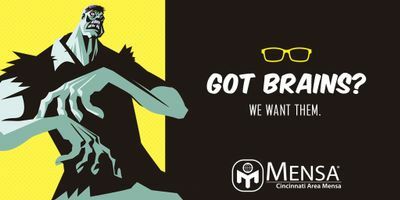 Did you know that Mensa has a local branch in Greater Cincinnati? We enjoy a variety of activities each week including movies, parties, beer tasting, canoeing, games, book discussions & dinners out. We also offer activities for gifted youth. Care to join us? Can you score in the top 2% on an IQ test? The Mensa home practice test is only $10 during September, so find out! https://www.us.mensa.org/join/mht/ Mensa admissions testing will be HALF PRICE ($30) in October! Email cincymensa46@gmail.com for testing locations and times.